Valerie Metcalfe at 1000 Miles Apart conference, University of Manitoba. October, 2015. Valerie Metcalfe.. 2017. Skyscape/Landscape plate. Porcelain, solder, glass. 40.6 cm w.
I have added a page on Winnipeg ceramist Valerie Metcalfe to Studio Ceramics Canada. Valerie has been a key ceramic artist in Winnipeg for over forty years. Her work varies from the elegantly functional to the eye-stopping artistic. The sample of works presented will give only a hint of her production but what a hint! Enjoy the story of Valerie Metcalfe. Let her know how much you enjoy her work. This entry was posted in Artist, Canada, Ceramics, Contemporary, Functional, Gas-firing, Manitoba, Porcelain, Pottery, Studio Ceramics Canada, Studio Pottery Canada, Throwing and tagged Manitoba, Winnipeg, Valerie Metcalfe on April 23, 2019 by Barry Morrison. Keith Campbell Exhibition: “50 Years in Clay: Still more to Say” at Jonathons, Sept. 14-30. Keith Campbell continues his commentary on Canadian history and politics with “TOASTING 150” celebrating Canada’s 150th Birthday with the portraits of the 23 Prime Ministers of Canada on porcelain toast. The works are part of a 50 years retrospective, “50 Years in Clay: Still more to Say“, at Jonathon Bancroft-Snell Gallery in London, ON, from Sept 14 to Sept 30th. Enjoy Keith’s wit and commentary. This entry was posted in Artist Update, Canada, Ceramics, Exhibition, Heads Up, Ontario, Porcelain and tagged Keith Campbell update, political commentary on September 7, 2017 by Barry Morrison. I have added a page on the Nova Scotia Artist, Carol Smeraldo. 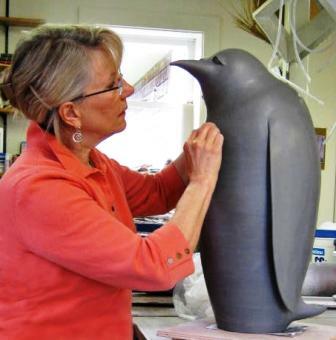 Carol is prolific potter and sculptor. Her works in raku and low -fire porcelain frequently incorporate other media. Though varied in style she displays an ongoing love for the sea: an underpinning theme for her explorations in media, design, and more recently, the cycle of creativity. Carol is also greatly recognized for her teaching and organizing work in the province: the Halifax Studio School of Pottery, her links with NSCADU, and in the development of the Nova Scotia Designer Crafts Council to name some highlights. Enjoy the story of Carol Smeraldo’s career and a sampling of her creations,and please share your thoughts. This entry was posted in Ceramics, Contemporary, Functional, Hand Building, Low fire, Mixed Media, New Artist Page, Nova Scotia, Porcelain, Raku, Raku firing, Sculptural on March 12, 2017 by Barry Morrison. Amélie Proulx wins the 2016 Winifred Shantz Award for Ceramics. The Canadian Clay & Glass Gallery has announced that Amélie Proulx has won the 2016 Winifred Shantz Award for Ceramics. The award will be presented at the Canadian Clay & Glass Gallery on November 12, 2016. The ceremony will feature a brief artist talk. Amélie Proulx from Lévis, QC, is a multidisciplinary artist working primarily with porcelain. She is interested in the possible shifts of meanings in language and in the perception of natural phenomena. She received a BFA from Concordia University in Montreal (2006) and an MFA from the Nova Scotia College of Art and Design University in Halifax (2010). Her artwork has been presented in solo and group exhibitions in Canada, the United States, Australia and France. In 2013, she received the RBC Emerging Artist People’s Choice Award at the Gardiner Museum in Toronto. She has participated in several residencies, notably at the European Ceramic Work Centre (The Netherlands, 2014) and the Guldargergaard International Ceramic Research Centre (Denmark, 2015). She teaches ceramics and visual arts at La Maison des métiers d’art de Québec and at Cégep de Sainte-Foy. She is represented by Galerie 3 in Quebec City. Proulx has been chosen for the Arts/Industry Program at the Kohler Company in Sheboygan, Wisconsin. There she will research and produce a new body of work that will convey ideas of technological translations of ceramics. Proulx will use the Shantz Award to prepare for this residency; she will generate 3D printed moulds at the artist-run centre La Chambre Blanche in Quebec City and CNC milled plaster moulds with Epic Welding in Medicine Hat, Alberta. The award was juried by Laura Kukkee, Rory MacDonald and Aaron Nelson. Proulx will receive $10,000. This prestigious national awards allows early career professionals to undertake a period of independent research, or other activities that will advance their artistic and professional practice at a key moment in their careers. The Winifred Shantz Award for Ceramics is supported by the Keith and Winifred Shantz Fund for the Arts, held at The Kitchener and Waterloo Community Foundation. About Winifred Shantz: The late Winifred Shantz was a driving force for the arts in Waterloo Region for more than 40 years. A successful ceramist, entrepreneur and visionary philanthropist, she was committed to finding ways to enable artists to reach their full potential. About The Kitchener and Waterloo Community Foundation: The Kitchener and Waterloo Community Foundation (KWCF) improves the quality of life in Kitchener-Waterloo and the surrounding area, now and for generations to come, by building community endowment, addressing needs through grant making, and providing leadership on key community issues. The Canadian Clay & Glass Gallery’s mission is to showcase the most innovative, influential contemporary Canadian ceramic, glass, and enamel artworks and to make them accessible to all through acclaimed exhibitions that address issues and themes relevant to our times, through an impressive selection of artworks in our Gallery Shop, and through intriguing public programs that engage, educate, and inspire. This entry was posted in Award, ceramic sculpture, Ceramics, Contemporary, Porcelain, Quebec and tagged amelie proulx, the Canadian Clay and Glass Gallery, winifred shantz award on October 13, 2016 by Barry Morrison. Porcelain master, Harlan House, now has a page on studioceramicscanada.com . The page will surprise many with the variety of styles and subjects Harlan has produced for almost 50 years. His detailed carving, appliqué and sprigging are familiar; however, there are other deeper messages, opinions and forms in his work throughout his career. His subjects range from the detailed life and beauty in his garden to frustration with the global economy and our “big box” life. He is open in his thoughts, words and experience. His own website and blog are further testaments to his generosity. This entry was posted in Alberta, Canada, Casting, Ceramics, Contemporaries, Functional, Hand Building, Installation, New Artist Page, Ontario, Porcelain, Sculptural, Studio Ceramics Canada, Studio Pottery Canada, Throwing and tagged Alberta, Harlan House, Ontario, Porcelain, sprigging on September 11, 2016 by Barry Morrison. Robin Hopper’s page was one of the first posted on this website, three years ago. It is also one of the most visited. A major update is long overdue. Artists’ pages on the site, their scope, format and content, have evolved, expanded. The revised page explores more of Robin’s past activities and work, and also touches on his more recent activities and passions during what for him are difficult times. Enjoy connecting with one of Canada’s most renowned ceramists, Robin Hopper RCA. This entry was posted in Artist Update, British Columbia, Ceramics, Contemporary, Functional, Porcelain, Sculptural, Studio Ceramics Canada and tagged British Columbia, Contemporary, Robin Hopper, Studio Ceramics Canada, update on May 29, 2016 by Barry Morrison.